If you’re in the United States this week, and you’re lucky,amidst the turkey and pie and traffic jams and football games, you’ve had a moment to actually think about the word Thanksgiving. Thanks. Giving. One reason this holiday is so treasured is that we feel better when we count our blessings. Research has borne this out time and time again, but as is often the case, you could save some time reading those studies and just listen to your mom or grandma on this count. But oh, it can be harder to practice. If your gathering included going around the table to name a blessing out loud, it was probably a little forced. And if six people in a row say they are grateful for family, you feel a little rude naming something else, what with your relatives right there looking at you. This year our family tried a new approach. 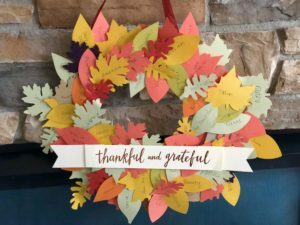 We all took a pile of paper leaves and wrote down a bunch of things for which we were grateful – and then we attached them to a wreath as we read them out loud and told stories. Hokey? Totally. Awesome? Totally. You don’t need a big family gathering to do this, and you don’t need a fancy gratitude journal either. Start small: if you zoom in to this photo, you’ll see entries for pickles and mashed potatoes. The key is, you have to DO IT, not just think about it. Take a piece of paper, right now. Don’t wait for the fancy journal or an official holiday. Even if your list says, “Thanksgiving is over” or “there is coffee” – start. Before we know it, we go from being thankful for pickles to the pickle makers to the truck driver who brought them to the store to the people who picked the cucumbers to the field where they grew to the sun and the rain… all that, just from one pickle. Imagine how far our thanks can reach.